These sweet little rum balls will make you feel the burn! Perfect for your Valentine or as a holiday treat. They are a little bit nice with the chocolate and a little bit naughty with the booze! My boss's wife has a tradition of making rum balls each Christmas. They are her signature item and they are delicious. Some have a truffle center others have liqueur soaked cherry centers. She makes them in three strengths ranging from Kahlua or Cointreau to Bacardi 151. They are always a hit at the company Christmas Party and my husband instantly fell in love with them. I was lucky enough to have her invite me over for a rum ball making tutorial. We had so much fun making a couple of batches of delicious rum balls. She sent me home with a tray of them to share with my then boyfriend. He proposed within a few weeks of that, so she swears it was the rum balls that pushed him over the edge. Hey, whatever it takes right? She makes them by feel and with years of experience, she makes them the best! I came home with a list of ingredients, but no measurements. So these are a very rough approximation of her rum balls. I didn't make the truffle or cherry centers this time, but they really do take them to the next level. One of these times I am going to have to do them that way too! Here's the thing about my husband, he loves for his food to bite back. If we go out for wings, he has to order at least 6 of the hottest ones on the menu. The whole time he tells us how good they are his face is red and he's crying. "It's fun" he says while nothing about it looks fun. "I'm fine" he says as I hold on to the phone ready to call 911 when he falls over. I used to help him eat those Blazin' wings, but my heat tolerance has faded a bit over the years and I have no interest in torturing myself! Of course when I made Jess's Tailgate Queso, he had to stir in a little of Pops' homemade habanero sauce. The first couple bites were fine, then he hit a hot spot and the tears started flowing! So it makes perfect sense that he likes the Bacardi 151 version of her rum balls best! It is always fun to watch people try one for the first time. There is the delicious flavor of chocolate that gives way to the warmth of the alcohol. They definitely make your mouth tingle. My husband requested a batch not too long ago. He requests things so seldom that I feel like I need to follow through when he does. We had a trivia night coming up and I was in charge of making some sweets to share, so I knew this would be a perfect time. Matt had fun sharing them with our table and a few people we met in line. He looked quite pleased with himself and his treat. We didn't win the trivia night, but I think I might have won a little extra piece of his heart! 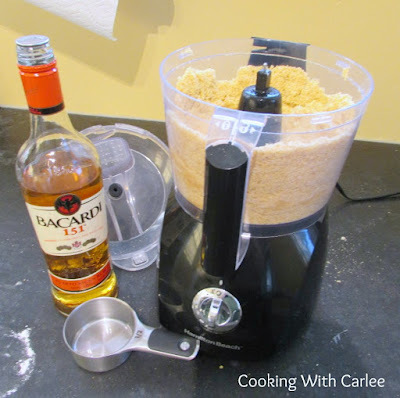 Process your vanilla wafers into crumbs in your food processor. Add the almond flour and cocoa powder, process to combine. Stir in the corn syrup and rum. Roll into small balls. I usually do a variety of sizes, larger for folks like my husband and a few smaller ones for people who just want to give them a try. Refrigerate for at least a half hour. When ready to dip, prepare your chocolate by melting and tempering it. Dip balls and decorate if desired. They may be eaten as soon as they are set, but they are better if you give them a few days to let the flavors really come together. Store in an airtight container at room temperature. Oh yes!! The name of these alone is fabulous, add in the gorgeous and cute factor plus the taste that has to be Ahhhmazing, and what a fantastic recipe!!! Love!! Thanks, Andrea! These are one of my husband's favorite treats. I only make them for him about once a year, but he is always in heaven when I do. Oh my goodness, YUM! Like Matt, my husband likes for his food to bite back, too, which makes me believe he'd LOVE these. Saving them for Valentine's Day. You know, since I should probably make him something sweet and different for that day. Thanks for sharing! I hope you do make them and I hope he loves them as much as mine does! Oh wow... I've got to try these! I've lost my heat tolerance as well. I have no idea why. Oh and I loved the dramatic music on the Mimi video. Too funny! I don't think we're missing much skipping out on the hotting thing on the menu! Isn't that music fun? Nothing like a little dramatic music for a dramatic dessert! I totally love the name and the story ... you are totally on to something here! These sound fabulous. Thank you! There are so many fun flavor combinations you could do with different liqueurs, but these are my husband's favorites! These looks soooooo delicious…can't wait to try them! They are definitely my husband's favorite! Omg these look amazing!! Thanks so much for sharing at #funtasticfriday ! Thank you, they are definitely one of my husband's favorites! I love this recipe. Chocolate is always a nice treat And these chocolates have an extra bonus!!!! Pinned and shared, these are perfect for Valentine's Day. I can see why they are your husband's favorite treat. The way to a man's heart is through his stomach and throwing a little 151 and he's yours forever!! It certainly didn't hurt and he did propose after my first batch, so there must be a correlation! They are fun to make and even more fun because I know he loves them so much! Sprinkles do make anything more fun, don't they? We are partial to these, though I prefer the Kahlua and Cointreau version instead of the 151 proof ones ;-) Good thing they are easy to make so we can each have our favorites! Thank you! There are only a few left, so my husband is really cherishing each bite at this point. What a special Valentine Treat! Hope you are having a great day and thanks so much for sharing your awesome recipe with us at Full Plate Thursday. It's fun to make a special treat for my hubby every once in a while! Thanks so much for hosting! These look great! My family would love them! Thanks so much for stopping by Inspiration Thursday. Pinned! 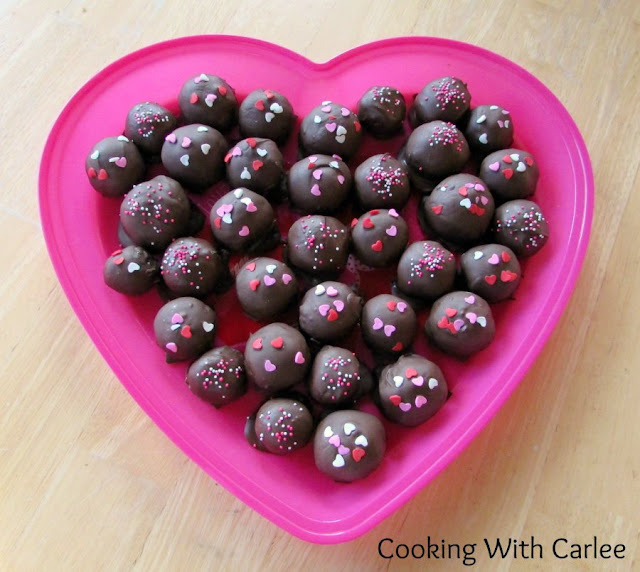 These rum balls look wonderful Carlee. I like the cherry soaked variety. The soaked cherries are pretty darn good, aren't they? Thanks, Quinn! Thanks, my husband sure loves them! These look so delicious! Thank you for sharing at Merry Monday! Thank you! It is fun to have something that I make that my husband feels like are just for him. 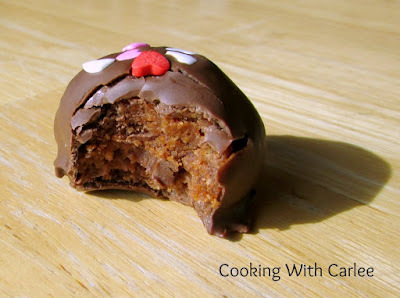 I've always wanted to try making a sweetie like this - these sound outstanding! Thanks for sharing this recipe Carlee, found this one at Saucy Saturday! They are definitely a special treat for the adults only! I hope you love them! I typically shy away from these type of recipes, but these look so fantastic, and I love the ingredients, so I just may have to try this! They look AMAZING!! I can see why your husband loves them. Thank you! They are definitely one of his favorite sweets!